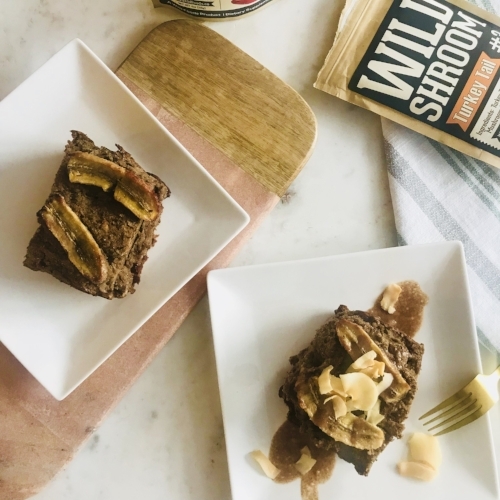 Adaptogenic Pumpkin Spice Banana Bread — Indulge in your health. So why not combine the two with the immune boosting, mood enhancing benefits of adaptogenic wild mushrooms-- Reishi and Turkey Tail? Just kidding. No turkeys involved. Reishi has been touted as the mushroom for "longevity" and "eternal youth" for thousands of years, reducing inflammation, slowing aging, and aiding in healthy liver and kidney function. Reishi is also thought to have anti-fungal (ironically) antiviral, anti-parasetic properties, in addition to adaptogenic properties. The word "adaptogenic" refers to specific compounds in plants that can help bring the body back into a state of homeostasis, or "balance." As an adaptogen, Reishi may help you to feel better-- helping the body to better cope with and manage both internal and external stressors. Turkey Tail mushrooms are apparently amongst the most common and adaptable of wild mushrooms, and are considered to have potent immune enhancing properties, along with adaptogenic properties that also help the body to combat stress. Pumpkin Spice and stress management are always desirable in my world, so I thought I'd experiment with a "new" banana bread to share with friends. It is super easy to make with a crusty top, and thick "pound cake" like center. Slice a wedge and toast it up in the toaster oven, or enjoy as is. Preheat oven to 350 degrees. Spray a bread pan with a non-stick cooking oil, or use coconut oil. In a small mixing bowl, combine chia with with 6 tbsp coconut milk. Stir and set to the side to gel for about 5 min. This is your binding agent. Aka: your egg. In a medium mixing bowl, mash FIVE bananas, and mix well with remaining coconut milk, and coconut oil until well combined. Add chia to wet ingredients. Stir well and then stir in your dry ingredients. Mix well and use clean hands to knead, or put hand inside a plastic baggy (like a food safety glove) and knead. Scoop into your bread pan and bake for 55 minutes. Remove and then cover with foil and bake for an additional 20 minutes. While cooling, stir together wet icing ingredients until well combined. Add less pumpkin pie spice, if preferred. When ready to serve, drizzle over bread and top with toasted coconut flakes.